Over the years, three distinct classes of digital cameras have developed, each with their own unique qualities. DSLR (digital single-lens reflex) and mirrorless cameras represent expensive options with larger sensors geared more towards camera aficionados. These digital cameras offer more manual control as well as the ability to be equipped with interchangeable lenses. 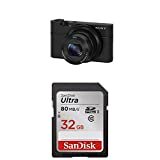 Point-and-shoot cameras, on the other hand, are a kind of digital camera that is cheaper and smaller with smaller sensors and less manual control. What is a Point-and-Shoot Digital Camera? In this article, we give a brief overview of point-and-shoot digital cameras, explaining basic terminology and discussing the advantages and disadvantage of this class of digital cameras. Then, we discuss one of the most popular point-and-shoot digital cameras on the market, specifically the Sony Rx100. Finally, we give our thoughts on the future of point-and-shoot digital cameras. Point-and-shoot digital cameras helped usher in the modern era of affordable, compact digital cameras. They were designed with amateur photographers in mind, appealing to people who had never purchased a digital camera before. As their name implies, they are particularly good at autofocusing, which means that the computer within the camera can utilize information from the environment to automatically control settings on the camera, like aperture, shutter speed, and ISO. While technically every modern camera that has autofocus functionality could be called a point-and-shoot camera, this term is generally preserved for the smallest sized cameras on the market which cannot utilize interchangeable lenses. Aperture refers to the size of the hole within the camera lens. It is similar to the pupil of our eye in that its size changes in order to alter how much light we take in. Aperture is usually represented by f/stops. A smaller f/stop refers to a larger aperture whereas a larger f/stop refers to a smaller aperture. The larger the aperture, the more light that is allowed into the body of the camera. This results in a smaller depth of field, which means that less parts of the image will be in focus. This is ideal when you want to emphasize a certain subject in your environment, like during portrait photography. Not only will certain parts of the image be in focus, but most of the image will actually be blurred. The smaller the aperture, the less light that is allowed into the body of the camera. This results in a larger depth of field, which means that more parts of the image will be in focus. This is ideal when you want to emphasize many subjects in your environment, like during landscape photography. Very little of the resultant image will be blurred. Instead, most of the image will appear crisp, focused, and equally emphasized. Most point-and-shoot digital cameras, like the Sony Rx100, offer an aperture range, which means that the aperture will shift as the focal length of the lens is altered. This is because different focal lengths affect how much light is available to be interpreted, which influences how large or small the aperture can be while still resulting in a clear, focused image. Shutter speed and ISO are intimately connected to the aperture of a camera. Shutter speed refers to how long the incoming light is allowed to enter the body of the camera whereas ISO measures how sensitive the camera is to light. Shutter speed is usually measured in fractions of a second whereas ISO is measured in the hundreds, typically 100 – 1600, and sometimes even higher. What’s great about point-and-shoot digital cameras is that they allow users to hold the shutter button down halfway in order to initiate the autofocus function. When users do this, the camera briefly exposes the image sensor to the light in the environment in order to analyze the right conditions for shooting. Then, it sets the aperture, shutter speed, and ISO to maximize the clarity of the image. Once the shutter is pressed down all the way, an image is taken. What happens here is that light from the environment is allowed to enter the body of the camera. Inside the camera there is an image sensor, which interprets this light through the use of pixels on its surface. These pixels are light-sensitive elements that translate the information from the incoming light into 1’s and 0’s – digital bytes. This process allows the camera to store the information from the light in a digital format on the camera’s memory card. This digital format can then be manipulated on various other electronics, like computers, televisions, and phones, albeit in a compressed form. The main advantage of point-and-shoot cameras is their size. They appeal most to users who want the smallest digital camera possible to maximize their mobility. This is ideal for travelers who want to remain as light as possible on the go and don’t want a heavy or large camera to weigh them down. Sony’s Rx100 is considered medium sized within the point-and-shoot market, meaning that it’s not the smallest camera available but certainly not the largest one either. Also, point-and-shoot cameras are extremely convenient if you are a beginner photographer who wants to focus more on simply getting the shot then tinkering with settings. Since point-and-shoot cameras are superior at automatically focusing the subject, they allow beginner photographers to concentrate more on finding their subjects and quickly taking the photograph instead of manually controlling every feature. Lastly, point-and-shoot cameras are generally very cheap, which makes them more accessible to more people. This also means that they are great for more rugged environments when the camera might get damaged or dirty. Some of the cheapest point-and-shoot cameras are less than $100, which means they could be easily replaced. The Sony Rx100 cost around $300 to $650 upon being released in 2012, but currently only costs from $100 to more than $1000. This indicates that the price of these cameras also drops significantly over time. The main disadvantage of point-and-shoot cameras like the Sony Rx100 is that they have a smaller image sensor. The image sensor is reduced in order to make the camera more compact, but this translates to a smaller region to interpret the incoming light. Ultimately, this means that the camera needs more light to optimally function. This is fine when plenty of light is available. But, when shooting in low-light settings, like at night, this smaller sensor can result in lower-quality images with lots of noise. Additionally, a smaller sensor means that the aperture, shutter speed, and ISO must stay within a certain range in order to provide the sensor with sufficient light. On larger sensors, users have more control over these settings because the sensor is large enough to usually create a properly exposed image. This allows photographers to experiment with different techniques that would be impossible on a point-and-shoot camera with a smaller sensor. For example, if a photographer wanted to take a photograph using a very large depth of field on a point-and-shoot camera, it’s likely that they would have to drop the shutter speed significantly to accommodate for the smaller sensor size. But, this slower shutter speed might result in noise or blurriness or otherwise compromise the artistic vision of the shot. 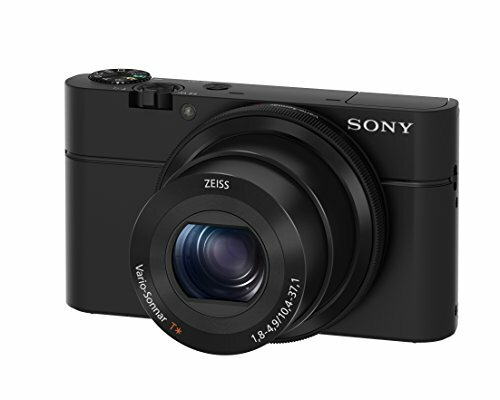 Sony’s Rx100 was released in late 2012 and features a 1-inch CMOS sensor with 20.2 million pixels. This size of sensor is relatively large in the market for point-and-shoot cameras and many customers have noted that the Rx100 offers the best image quality of any point-and-shoot camera currently available. The Rx100 features a Carl-Zeiss Vario-Sonnar T lens with a 28mm-100mm capability. These numbers refer to the distance between the lens and the image sensor. The larger the number, the greater the subject is magnified. The smaller the number, the more wide-angle the shot is. The aperture range on this lens is f/1.8 to f/4.9. The ISO range on the Rx100 is 125-6400. While this is the effective range, Sony advertises that the ISO can be expanded up to 25,600 in certain situations. The Rx100 can also shoot video, specifically 1080p at 60 fps. Lastly, the Rx100 features a 3-inch LCD screen with 1.2 million screen dots. This screen allows for live mode while shooting, which means you can preview the image before you take it. Most customers have noted that the Rx100’s sensor size makes the camera unbeatable at its price point. This 1-inch sensor allows for crisp, clear images to be taken in low-light settings. This makes the camera perfect for night-time shooting or for shooting indoors. Additionally, the maximum aperture on this camera is very large for a point-and-shoot camera, which means this camera is great for snapping portraits or selfie’s when you want the background to be blurred. The Rx100 also features a contrast detect autofocus system which allows for face detection. Many customers have noted that this autofocus system is incredibly quick, which is an important distinction for point-and-shoot digital cameras. 20.2 MP 1"-type Exmor R CMOS sensor. 28-100mm equivalent F/1.8-4.9 lens. Continuous shooting up to 10 FPS. ISO 160-12800, expandable ISO 100, 125, and 25,600. Many companies will advertise their cameras as having autofocus capabilities. Yet, the autofocus is often ineffective or too slow to be convenient. The Rx100 mitigates these problems by featuring a fast autofocus that is also effective. Many customers have noted that they do not even check the image after it has been captured, as they are trusting that the camera will get the job done every time. Even further, some camera users are used to autofocus systems that require multiple pictures to be taken in order to get a clear image. But, the Rx100 only requires a picture to be taken once to get the desired shot. Lastly, due to the f/1.8 maximum aperture, the Rx100 is great for macro photography when the user wants to capture up-close details of a subject. Carl Zeiss is known for producing some of the highest quality glass in the industry, and it’s a rare treat that point-and-shoot cameras feature such a high-quality lens. Most of Sony’s point-and-shoots feature this kind of Zeiss lens, which makes images vibrant and colorful. Most of the disadvantages of this camera have to do with the hardware of the camera. For example, many customers have complained that there is not a button on the top of the camera for turning the flash on and off. Instead, users have to use the menu option on the LCD screen, which takes considerable time and can be frustrating if you are in a rush. Additionally, the Zeiss lens zooms in and out very slowly, which could also limit the mobility of the photographer. This is crucial for a point-and-shoot camera since convenience is one of the most important factors. Having to wait a couple of extra seconds could mean a missed shot or photo opportunity. Lastly, many commenters have noted that the Rx100 is a ​great vlogging camera due to its small size and HD video recording ability. Yet, it does not feature a fully-articulated LCD screen, which would make it ideal for filming yourself and ensuring that you are always in the frame. While this is certainly a rare feature for point-and-shoot cameras, many customers have claimed that the higher price of the Rx100 warrants this additional feature. We think that the Rx100 represents the cutting edge when it comes to point-and-shoot digital cameras. Not only is it relatively cheap and compact, but it manages to achieve these things while not compromising on photograph or video quality. We think the Carl Zeiss lens on the Rx100 represents a unique feature that most point-and-shoot cameras cannot match. For this reason alone, we think the Rx100 is a worthwhile purchase. We think point-and-shoot cameras are only going to get smaller with larger sensors in the future. Eventually, we think the boundaries between DSLR, mirrorless, and point-and-shoot cameras will dissolve, and there will only be one type of digital camera. Specifically, this camera will feature the best elements of all these types of cameras while still remaining highly portable with fantastic autofocusing technology. The Sony RX100 is a great camera that offers excellent image quality and amazing features. However, customers will have to accept certain limitations if they want a cheap digital camera, like a smaller image sensor, lack of manual control, and the lack of a fully-articulated screen.